A young woman returns a handbag left behind on the subway to a widow who has questionable motives. 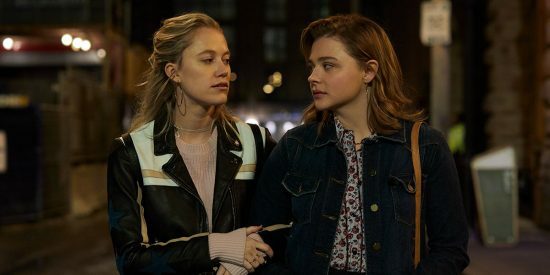 In an act of kindness Frances (Chloë Grace Moretz) visits the home of a lonely woman named Greta (Isabelle Huppert) to reunite her with a lost handbag; a mother-daughter relationship develops between them until a disturbing discovery. What happens afterwards is best described as a blatant mix of Fatal Attraction, The Silence of the Lambs and Psycho. Isabelle Huppert relishes playing a villainess with the dance moves of Jame Gumb and obsessiveness of Alex Forrest where Stephen Rea experiences the same fate as Det. Milton Arbogast in a derivative pulp noir story. Even the misdirect at the end with the mysterious visitor is given away by the editing and camera work. Filmmaker Neil Jordan is capable of so much more than this but instead drowns in the mediocracy. Trevor Hogg is a freelance video editor and writer who currently resides in Canada; he can be found at LinkedIn.